The world's first bionic dog, a Belgian shepherd named Storm, now has a carbon fiber prosthetic paw. The dog underwent an amputation earlier this year to remove a tumor. "The technology is not just the first time that the implant type has been used outside the human finger." "Because it has been implanted into the radius of the forearm of the dog, it will act as a model for human amputees in the future and provides hope for people without feet or hands." 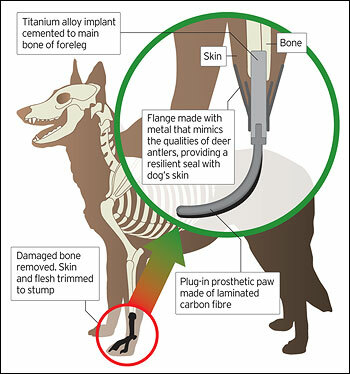 The implant, made of titanium alloy, is cemented to the main bone of Storm's foreleg. It is hoped that the dog's skin could eventually bond with the implant. A plug-in prosthetic paw made of laminated carbon fiber is inserted into the implant. Readers may recall that Jaime Sommers, the Bionic Woman (a spin-off of The Six-Million Dollar Man, discovered in one episode that there was also a bionic dog. In The Bionic Dog, aired in September of 1977, Jaime discovers the existence of Maximillian, whose cybernetics were implanted six years earlier. Max is about to be put down and autopsied to discover why his bionics are beginning to break down. She decides to save him no matter what the cost. From the Telegraph via Splutch.